In September 1904, a group of six Chinese students arrived at MIT, greeted with much press fanfare. The first Chinese government-sponsored students at MIT since the recall of the CEM, they came under the auspices of the Guangdong (Kwangtung) provincial government, part of a broader wave of students sent abroad (to the US, Europe or Japan) by the Chinese provincial governments that had been growing since 1890. Photo from Mei Zhou Zhongguo xue sheng hui 美洲中國學生會. Mei Zhou Liu Xue Bao Gao. [California: Mei Zhou Zhongguo xue sheng hui], 1905. Haithi Trust. Students recommended for degrees, MIT Faculty minutes, 1908. Image courtesy MIT Archives and Special Collections. — "SIX CHINAMEN NOW AT TECH," Boston Globe, Oct. 16, 1904. Two of these students – Tse Tsok Kai and Wen Ching Yu – went on to become the first Chinese students awarded BS degrees from MIT: Tse in Mining Engineering (3.1) and Wen in Mining and Metallurgy Engineering (3.3). 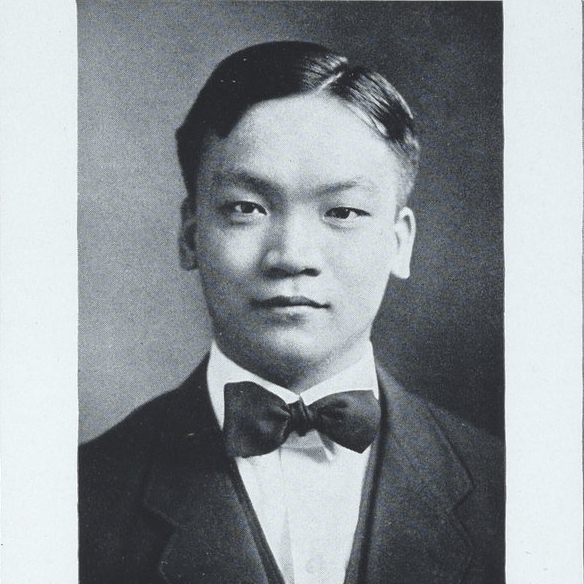 Heenan Tinching Shen, followed the next year, receiving his BS in Naval Architecture (Course XIII) in 1909. MIT Senior Portfolio 1908. Image courtesy MIT Archives and Special Collections. Tse Tsok Kai (1887-?) 謝作楷/謝莊伯 was a native of Xinhui, Guangdong Province who excelled in his studies from an early age. A student at Queen's College in Hong Kong, Tse was the top student in his year (dux). Graduating in 1903, he worked for a year as a teacher at the Sacred Heart College in Canton. In 1904, Tse qualified as an Imperial Scholar, taking second place in the Imperial Students' Examination, which was held for the last time in April 1904. Searching for new opportunities, Tse and several other "Queen's boys" sat for the special examination in May 1904 to qualify for overseas study. With their strong training in English, as well as Chinese, it is perhaps not surprising that five of the scholarship winners were Queen's boys. Tse and the others set sail for the US on the Empress of India, traveling under the care of Chen Jintao (also a Queen's College alumnus), and arrived in Seattle in July 1904. At MIT, Tse enrolled in Mining Engineering and Metallurgy (Course III) and joined the Mining Engineering Society. He wrote his thesis with Nelson S Hammond on "Chemical Equilibria of Lead Oxide With Reference to Carbon Monoxide and Carbon Dioxide." Tse seems to have been quite a figure on campus, and was mentioned several times in the MIT yearbooks. After receiving his BS degree in 1908, Tse went on to receive his MS in 1909 with a thesis entitled "Study of a Wifely Table." A classmate remembered that Tse jumped up and down and yelled with joy when he received his MS degree, going against stereotype of the "stoic Chinaman." Joining the American Institute of Mining Engineers, between 1909 and 1911, Tse worked as a mining engineer for the Vulture Mining Company. He returned to China in February 1911, shortly before the Republican Revolution of that October. Tse taught for a year at the College of Communications (Jiaotung) in Beijing, and also worked as an Inspector for the Ministry of Agriculture and Forestry. From 1912 until 1915, he served as the Director of the Mining Bureau in Canton, following which he assumed a post as Assistant Manager of the Kwang Tung Electric Supply Company in Canton. With his knowledge of both American engineering and management practices, Tse was credited with turning around the operation of this early Chinese power plant, and he rose to the position of Director. Tse was a member of the Association of Chinese and American Engineers, and in 1923, was elected Vice President of the Canton Returned Students' Association. Tse later entered finance and became the Director General of the Internal Revenue Administration. Wen Ching Yu (1881-?) 温宗禺/溫善甫 was a native of Sinning (Taishan), Guangdong Province, who studied at Tienstin (Tianjin) University (Peiyang Imperial College) before winning one of the coveted scholarships for study abroad. At MIT, Wen joined Tse as a student in Course III (Mining Engineering and Metallurgy) and in the Mining Engineering Society. The two also participated together in the Mining Engineering Summer School organized by Course III in 1906, traveling from Boston to Niagara Falls to visit mining companies and geological sites under the direction of faculty. On this trip, the two Chinese students were interrogated by immigration officials when crossing the US-Canadian border. Wen completed his BS in 1908, and went on to receive his MS from MIT in 1909 with a thesis on the "Heat of formation of some ferro-calcic singulo-silicate," which included a "design of plant for smelting and converting a sulphide copper ore." Wen then enrolled at Columbia University, where he received his PhD in 1911, becoming MIT's first Chinese alum to receive a doctoral degree. Wen's PhD thesis for Columbia received a notice in the Journal of Metallurgical and Chemical Engineering (volume IX, number 6). After he returned to China, Wen was appointed professor of mining and mineralogy at the Government University at Peking (University of Beijing), and later became head of the engineering school. He remained very involved with alumni activities in China, and was elected first president of the Technology Club of Beijing, which was formed on September 27, 1917. The Chinese students made a most memorable impression on their American classmates during their time at MIT. In 1921, a classmate visited Tse and Wen in China, writing this letter of his experiences and memories to the alumni magazine. Shen Ting Ching (1879-?) 沈頲清/沈希南 or Heenan Tinching Shen, a native of Houguan (now Fuzhou) in Fujian Province, was the grandson of famous Chinese official, Shen Baozhen 沈葆禎 (1820-79), a key advocate of the Self-Strengthening reform movement (1861-1895) of the late Qing. The most mature and experienced of this group, Shen had graduated from the Fuzhou Naval Academy, studied in the UK, and served for several years as an interpreter with the Chinese Legation in London. He then worked as an interpreter and administrator under the Viceroy of Guangdong and Guangxi, before being sent to the US for further study. Unlike Tse and Wen, Shen did not have to enter the competitive examination for scholarship support, but was directly recommended by the Viceroy. While studying Shen continued to serve in an official capacity for the Guangdong provincial government, acting as a director of the government-sponsored students. Shen initially began in electrical engineering at MIT, but later changed to naval architecture. He was very active during his student years at MIT, and especially dedicated to community service. Prominent in the Chinese Students' Alliance of the Eastern States, Shen was elected Historian of this organization in 1907, and also served on the committee to revise the Alliance constitution. He later served on the Board of Representatives, as Chinese Business Manager, and in other leadership roles. In 1909, Shen joined with another MIT student and eight Harvard students to establish a school for working men in Boston Chinatown under the auspices of a General Welfare Association of Boston, for which he served as Treasurer. At the school, Shen taught math as well as modern Chinese history. At MIT, Shen was elected vice-president of the Naval Architectural Society in 1909, and also a member of the Civil Engineering Society. He was a founding member of the Chinese Students' Club, and a founding first vice-president of the Cosmopolitan Club, both established in 1910, while Shen was a graduate student. Subjects Shen took at MIT included "Theory of Warship Design," of obvious relevance to China at the time. He received the BS in naval architecture in 1909, with a thesis on "An Investigation of Steam Breakage through a Labyrinth Packing." He does not appear to have finished his graduate degree. After returning to China, Shen held various official positions, eventually rising to serve as the Director of the Fuzhou Navy Yard at Mawei, which had been built in 1867 as one of the key initiatives of China's Self-Strengthening Movement. Thus, he continued his grandfather's legacy. For his work supervising ship construction for the Chinese Navy, Shen received several medals. In the wake of these pioneering students, between roughly 1908 and 1917, Mining Engineering and Metallurgy (Course III) and Naval Architecture and Marine Engineering (Course XIII) would become two of the most popular courses for Chinese students at MIT. This is perhaps not surprising given that the modernization of mining and the Chinese Navy were both strategic goals early embraced by China's Self-Strengthening Movement. Regarding mining in particular, as Shellen Xiao Wu has written, although the Chinese possessed considerable knowledge of geology and mining before the introduction of Western machine mining in China, the mining of coal, in particular, assumed a new importance in the age of empires. Not only was large-scale coal extraction essential for industrialization, it was "inextricably linked to sovereignty, state power, and property rights [in China] since the late nineteenth and turn of the twentieth centuries." (29) As the foreign powers scrambled for mining concessions in China, the government struggled to preserve control over mineral resources and mining rights. Against this backdrop, the training of mining engineers to replace foreign mining experts became an urgent mission, crucial both to industrialization and the protection of Chinese sovereignty in the face of Western imperial encroachment. The first MIT-trained mining engineers, Tse and Wen, were also the first Chinese students to earn MS degrees at MIT, both in 1909. The first Chinese students to earn MIT doctorates were Ming CHOW and Yu Liang YEH in 1920. MIT Faculty Records, Monday, June 7, 1920, 79. Courtesy MIT Archives and Special Collections. Notes: The students had prepared at various top institutions in China and Hong Kong including Nanyang in Shanghai (Chen), Tsienstin or Peiyang Imperial College (Lee and Wen), Queen's College in Hong Kong (Lee, Lo, and Tse), and the Chinese Naval College or Fuzhou Naval Academy (Shen). Two students left MIT after one year: Lee Tsan-chi transferred to Worcester Polytechnic Institute, and then the University of Pennsylvania and Lo Ting Yu transferred to the New Bedford Textile School. By 1905, there were 105 Chinese students in the US, 51 in colleges and universities, and the rest in high schools or other institutions. (Dragon Student, 1905). The majority were government-sponsored. Sources: "Sons of the East Prefer America," The Oregon Daily Journal, Portland, July 16, 1904, page 7, “New Foreign Students: Six Representatives of the Chinese Empire Arrive," The Tech, Volume XXIV, Number 1, September 28, 1904, "Six Chinamen Now at Tech: Studying Engineering and Chemistry," Boston Globe, October 16, 1904, SM3, "Tech Reopens (Several Foreigners among the Freshmen)," Boston Globe, September 28, 1904,"M.I.T. Class of Many Nations," Boston Post, September 29, 1904, "Six Chinese Students Sent to New Bedford," The Friend, November 4, 1905, Volume 79, no. 17, Philadelphia, 130-131, Mei Zhou Zhongguo xue sheng hui 美洲中國學生會. Mei Zhou Liu Xue Bao Gao. [California: Mei Zhou Zhongguo xue sheng hui], 1905. Haithi Trust. Who's Who of American Returned Students (You Mei tongxue lu), Beijing: Tsinghua College, 1917, China Review, Volume 4, China Trade Bureau, Incorporated, 1923, MIT Chinese Students Directory: For the Past Fifty Years, 1931. Chinese Students' Monthly, Volume 2.4, March 1907, Volume 2.6, May 1907, Volume 5.2, December 1909, Volume 4.5, February 1910, Volume 5.1, November 1909, Volume 5.7, May 1910, Volume 10.2, November 1914, Volume 11.8, June 1916, Weili Ye, Seeking Modernity in China's Name: Chinese Students in the United States, 1900-1927, Stanford: Stanford University Press, 2001, Boston Globe, June 13, 1910, page 5, http://www.360doc.com/content/10/1018/19/3865247_62037948.shtml, The Technology Review, volume 12, 1910, The Technology Review, volume 19, 1917, 620, The Technology Review, volume 23, 1921, Stokes, Gwenneth. Queen's College, 1862-1962. Hong Kong: Printed by the Standard Press, 1962, 255, Marvin, George, "The American Spirit in Chinese Education," Outlook, Nov 28, 1908, pp. 667ff, MIT Faculty Records, Volume 14, 1904-05, Volume 15, 1905-06, Volume 16, 1907-08, Volume 17, 1908-09, Course Catalogue of the Massachusetts Institute of Technology 1909-1910, “A short account of Boston Tech,” The Technique 1906, p. 304, The Technique, 1908, p. 336, The Technique, 1907, p. 316, Technique 1910, p. 255, MIT Senior Class Portfolio 1908, Wen, Ching Yu, 1881-, Heat of formation of some ferro-calcic singulo-silicates, Thesis Min'g 1909 M.S., Nelson S. Hammond and Tsok Kai Tse, Chemical equilibria of lead oxide with reference to carbon monoxide and carbon dioxide, Thesis Min'g 1908 B.S., Tse, Tsok Kai, Study of a Wilfley table, Thesis Min'g 1909 M.S, Shen, Heenan T, Design of apparatus for the investigation of labyrinth packing, Thesis N.A. 1909 B.S. Shellen Xiao Wu, Empires of Coal: Fueling China's Entry into the Modern World Order, 1860-1920, Stanford: Stanford University Press, 2015.